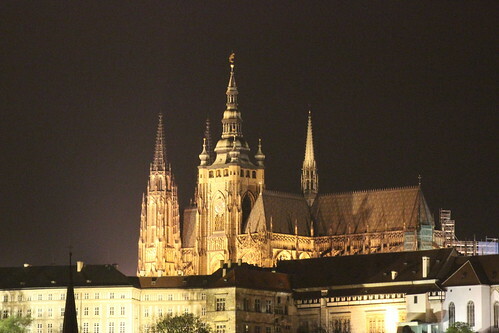 Prague Church of Our Lady Victorious Infant Jesus of Prague, a photo by Christopher OKeefe on Flickr. I really regret that I left so little time to explore Prague. We had less than a day there and I feel like there was so much more to see. This entry was posted in challenges, Daily Prompt, photography, travel and tagged daily prmpt, postaday, Prague, regret on November 30, 2013 by milfordstreet. This year, as I began to learn about making photographs at night, I doscovered not only the beauty of light and its sources but also the interplay between light and water. Day or night, water creates great reflections, perhaps seen more dramtically at night. It doesn’t have to be a perfect mirror image, like the photo of the Louvre Pyramid, but can be more abstract and transform a rather mundane subject, such as the tram stop pictured above, into something interesting. This entry was posted in challenges, london, paris, photography, travel and tagged light, postaday, reflection, water, weekly challenge on November 29, 2013 by milfordstreet. The Waterfire extends across the downtown. This entry was posted in challenges, Daily Prompt, photography, travel and tagged covet, daily prompt, postaday, travel on November 29, 2013 by milfordstreet. Piano Player, a photo by Christopher OKeefe on Flickr. To me, it would take a lot of courage to just spontaneously play a tune in public. 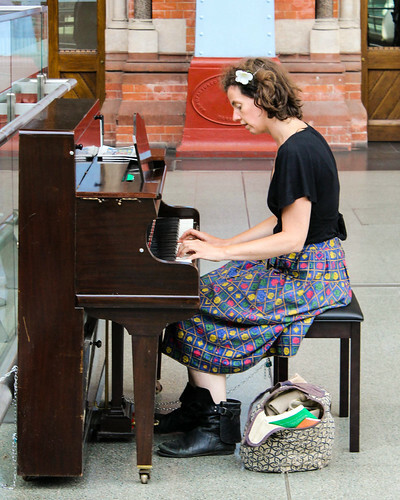 St Pancras Station in London has a couple of pianos for people to play. This woman just sat down and played a song before moving on. This entry was posted in challenges, Daily Prompt, london, street photography and tagged courage, daily prompt, piano, postaday, st pancras on November 28, 2013 by milfordstreet. Looking Out Over the Beach, a photo by Christopher OKeefe on Flickr. When this photograph was made, I recall wondering what this man was thinking as he stood looking across the beach at the ocean. 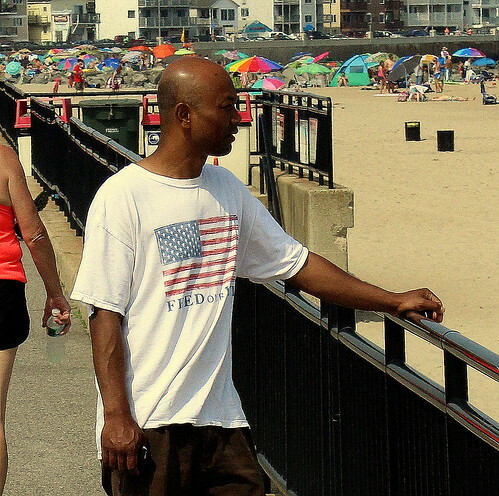 He seemed different from those around him who either moved along the sidewalk or sunned themselves on the beach. This entry was posted in challenges, Daily Prompt, street photography and tagged beach, contemplate, daily prompt, flag, postaday on November 27, 2013 by milfordstreet. Kissing Couple, a photo by Christopher OKeefe on Flickr. 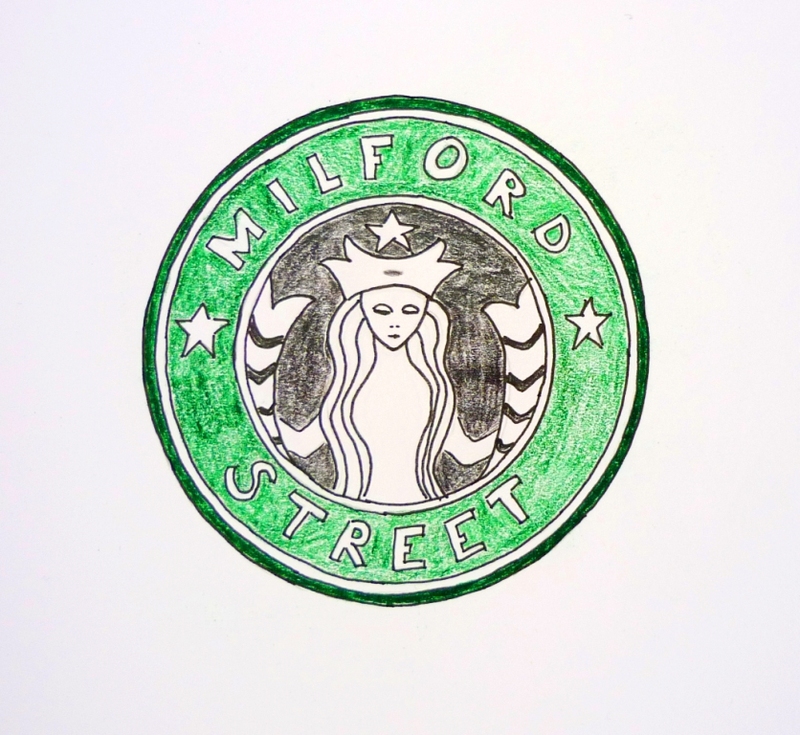 I’d venture to guess there is a certain level of temptation here. This was taken outside of a pub not far from Trafalgar Square in London. This entry was posted in challenges, Daily Prompt, london, street photography and tagged couple, daily prompt, kissing, postaday, temptation on November 26, 2013 by milfordstreet. 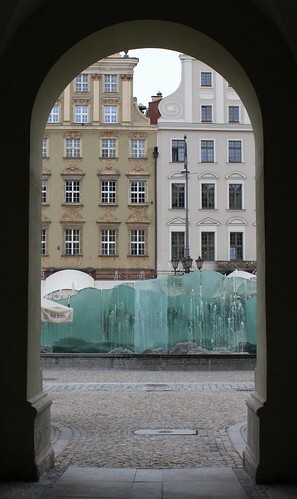 Market Square (Rynek) Wroclaw-2, a photo by Christopher OKeefe on Flickr. It was fairly close taking a photograph through this arch. In the background is a fountain in Wrocław Poland’s Rynek (market square).